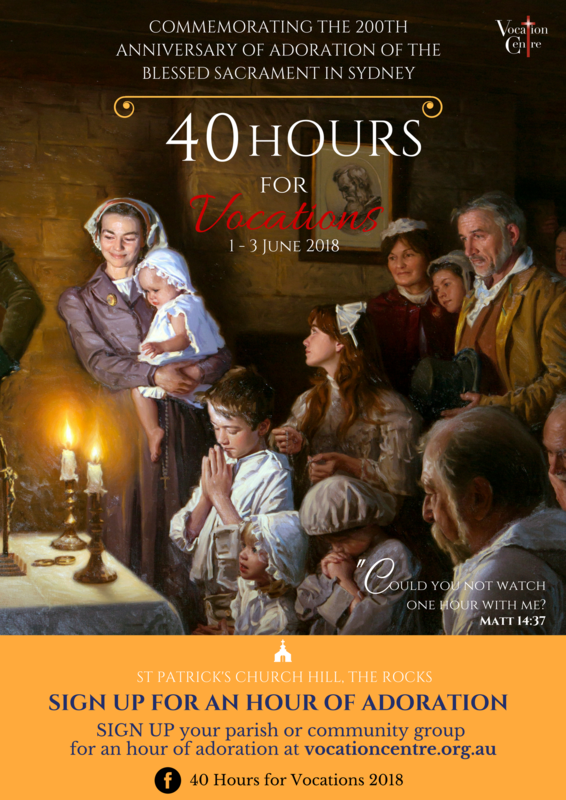 You’re invited to pray with us for an hour at St Patrick’s Church Hill as the Archdiocese of Sydney dedicates 40 Hours of Adoration to pray for vocations. 40 Hours includes Mass, Confession, communal and personal prayer, and guided reflections before the Blessed Sacrament. During our 40 Hours of Eucharistic Adoration for Vocations, we need YOUR prayers to help young men and women answer God’s call to a vocation to the priesthood or consecrated life! During the early years in Sydney, there was a period when Catholics had no priests to minister to them. They worshiped God by adoring the Blessed Sacrament in the home of William Davis, where St Patrick’s Church Hill now stands. This is depicted in the painting in the poster above by Paul Newtown. 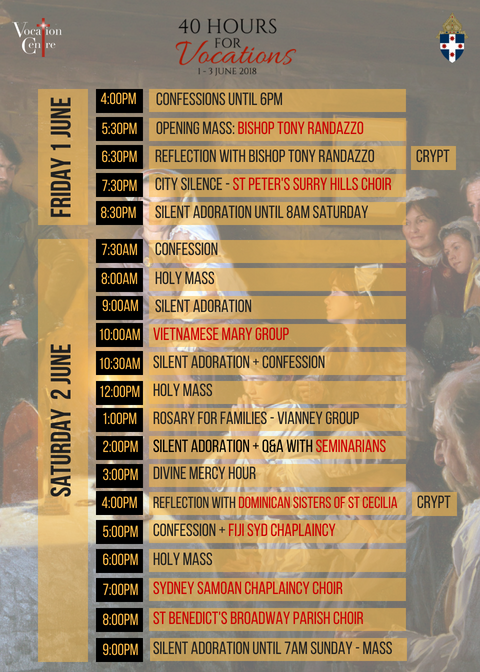 This year marks the 200th Anniversary of Eucharistic Adoration in Australia and in June, Sydney Catholics are invited to come together to adore the Blessed Sacrament as our ancestors in faith did. Join us – even if just for one hour – any time between 7:30pm Friday to 7am Sunday.